Glasgow Acting Academy is one of Glasgow's most exciting stage schools. Please explore our website to find out more about us. 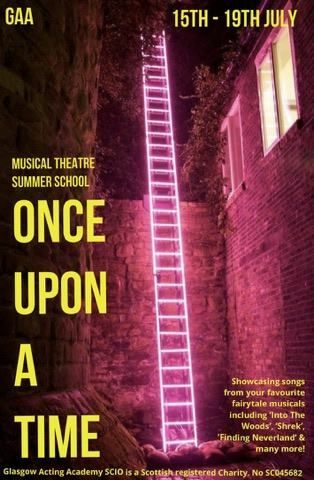 Once Upon A Time Summer School : This musical theatre week will be showcasing numbers from your favorite fairy tale musicals including 'Shrek', ' Finding Neverland' and 'Into The Woods'. Monday 15th, Tuesday 16th, Thursday 18th and Friday 19th July from 10am-4pm. A mini musical will be performed at the end of the week for friends and family. This is for ages 12-18.